player BELOW! 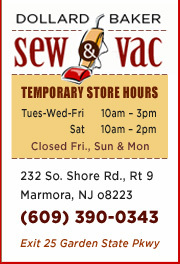 Dollard-Baker Sew & Vac has been serving happy customers in southern New Jersey for 95 years! Original owner, the late Thomas Dollard, operated his sewing machine and vacuum shop in Atlantic City in the early 1920s. These days, 4th generation great-granddaughter, Christina Dollard, joins her father, John Dollard, in helping customers learn about the latest sewing machines and vacuums; and how maintenance and service will keep your machines in great condition. We are proud to serve the Upper Township community at our shop located at South Shore Plaza, 232 So. Shore Road, (Route 9) in Marmora, New Jersey. Listen to Dollard's Radio Commercial!